Swiss Made featuring an ETA Caliber 7750, 3-hand (hour, minute, chronograph seconds) automatic chronograph with date and 12-hour, 30-minute, and continuously running 60-second subdials. 42 hour power reserve - fully wound. High Grade Dual Sapphire Crystals with anti-reflective coating for a superior look, maximum resistance to scratching, and superb clarity. Numbered Limited Edition of 1000 watches. 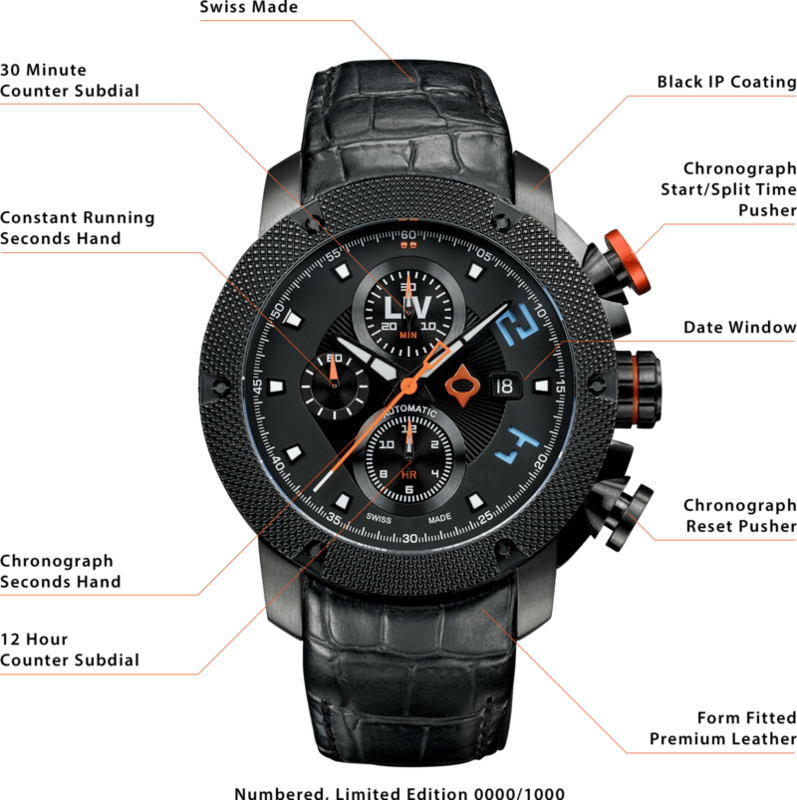 "Very nice watch with chic design and sporty look. Materials of excellent quality. Very nice watch with Swiss automatic device and at an affordable price. I am a fan!!!" If the ETA Valjoux 7750 is one of your grail watches, LIV has put it within easy reach sparing nothing in quality of materials, fit, finish, or design. Our skilled horologists masterfully place this industry-best automatic chronograph inside our iconic GX case, crafted and hand-finished out of premium 316L stainless steel. Then they crown it with our intricate 3D, multi-layer dial. We use a high-quality sapphire, anti-reflective crystal to for maximum clarity and scratch resistance, impeccably showcasing your dial and the display of time. Rather than hide the world’s best auto chrono movement behind a solid case back, we display this micro-engineered marvel with a screw down exhibition case back. Even though mineral crystal is often used for an exhibition case back by other brands, LIV uses the same high-grade sapphire crystal in the GX-AC’s case back. It is not in the DNA of LIV Watches to go half measures anywhere. 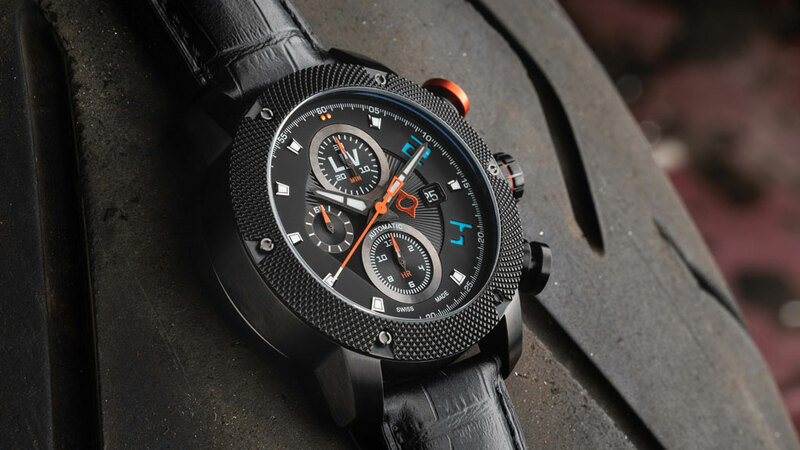 A variety of hand-curated leathers, supple silicone, and other premium materials keep this unique timepiece securely, and stylishly on your wrist. The beauty of the GX-AC belies the beast beneath, built for a lifetime of adventures. Consider this an heirloom in the making. 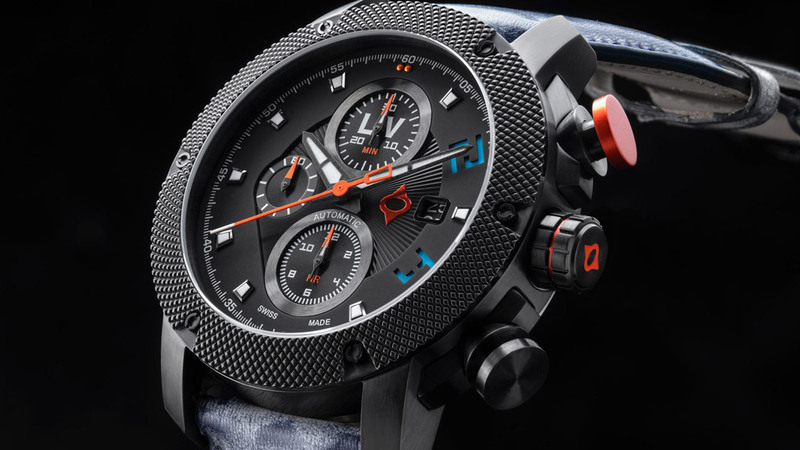 The GX-AC is a numbered limited-edition of 1000 watches per color. Be unique in you watch circle, and indeed around the world. I don't have any words to describe how amazing is my GX Swiss Automatic Chronograph. 100% Truth - because that’s what matters!!! This watch is SPECTACULAR - I can’t say I have 50 watches - but in my less then 10 watch collection I have had watches that range from $3000 - $31,000 and this Watch is worth every dollar (Girard-Perregaux, Chronoswiss, Breitling) Way smarter to get a LIV & save thousands for an increíble design, craftsmanship, build .... it really an awesome watch. Even the strap is great.